The Limelight Hydrangea Tree is Being touted as one of the best performing bloomers of the past few years! These trees explode with blooms in early summer. It's incredible. Tons of light flowers bloom in conical-shaped clusters that are showy and long-lasting. As these unique flower heads age into autumn they begin turning lovely shades of pale and blushing pink. Limelight's blooms are not only attractive in outdoor landscaping, but also make a good choice for both fresh and dried flower arrangements indoors as well. 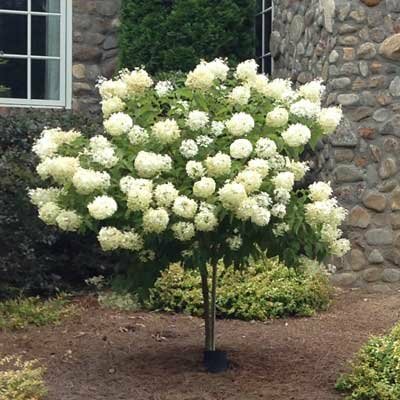 Versatile and practically maintenance-free, this hot new Hydrangea tree is an absolute sensation. This Hydrangea Tree grows up to 6-8 ft. tall, but can be easily pruned to take the shape of a smaller tree. Whatever challenges your landscaping design may pose this flowering shrub will perform like a superstar. It's great in your garden, in tight spaces along your home, or even potted up on your patio. You can put this tree anywhere and it will look great. Try grouping these Hydrangea trees for accent anywhere you want a punch of brilliant color. Durable, gorgeous and carefree, Limelight trees will certainly enhance any area of your outdoor living space. Disease and pest resistant, this flowering beauty thrives in zones 3-8. Drought tolerant once established and adaptable to most soil types... Limelight Hydrangea even tolerates urban and street conditions. They're selling fast, so order your Limelight Hydrangea Tree today. You get a branched tree that is ready to pack on huge blooms for months!